You pause in your speech, looking out over the gray, uniform masses that are the population of Euphoria. “We know the hardship that the food rationing is causing for many of you. But believe me when I say, the Council is doing everything to resolve the situation. We will not be extorted by the Wastelanders. Euphoria will not be blackmailed. Euphoria is strong. Euphoria will prevail. You are strong! You! Will! Prevail!” The crowds cheer. You just told them they would hunger, maybe starve, and they cheer at you. Bless the day the Council closed all schools in favour of the Educational Broadcast Program. 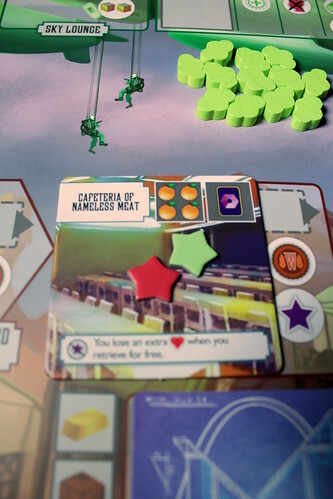 Euphoria is the second worker placement game by Stonemaier Games, makers of Viticulture. But they’ve strolled a long way from wine making with Euphoria. The subtitle “Building a better dystopia” makes that pretty clear, but it is also misleading. A better dystopia doesn’t mean one where conditions for the common folk are improving, it means one where you are at the top, because you know what they say: dystopia is only bad at the bottom. But that mindset is a problem in a worker placement game, because the bottom is where your workers come from, and once they realise they are at the bottom they get uppity and will quickly leave your employ. And the city, if they know what’s good for them. Your workers understanding the mess they are living in is an important and beautifully simple mechanism in Euphoria: your workers are dice, the value showing is their knowledge, and whenever you get a worker from somewhere you have to roll him. If the knowledge of your available workers plus your score on the knowledge track ever exceeds 15, your smartest worker leaves – quite a setback, since you used an action and valuable resources to have him cloned. But as long as your workers stay dumb and loyal, they are very useful tools. Each round, you may send one of them – or more, if they have the same knowledge – to work for you on the game board, in the city of Euphoria, Subterra, the Wastelands or on the Icarites’ zeppelins. Each of these four factions has similar actions to perform with your workers. You can have your workers harvest the factions’s commodity: Energy, Water, Food and the mysterious drug Bliss. Harvesting commodities is good, you need a lot of them, and there is enough space in each harvest zone to hold any number of workers. But putting too many workers in one place is risky, when their collective knowledge is too high they start talking and you move up on the knowledge chart. On the other hand, you also harvest more commodities with smarter workers. The next occupation for the dumb masses is digging tunnels. For obvious reasons, this is not an option in Icarite territory. The other three factions are all trying to tunnel into each others’ territory to steal commodities. Working on the tunnel lets you take a resource – Gold, Stone or Clay – or draw an Artifact Card, a valuable find from the world that was. As the game progresses, you may even take both. Once the tunnel is completed (by moving the mineple to the last tunnel space) it reveals another Action Space where you can steal large amounts of commodities without the risk of anyone getting smart. 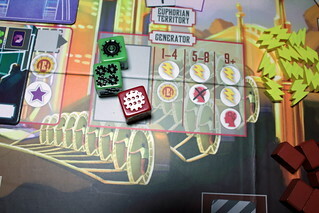 Both the tunnel and the extra action only have space for one worker, placing a die there bumps the previous occupant back to its owner who immediately rolls it and adds it to his worker pool. Bumping is great fun. In fact, I sometimes bump workers when their owner has some high knowledge workers available already just to force them to roll and lose a die. It’s that kind of game. With the workers staying in the harvest zones, you’re bound to run out pretty quickly. 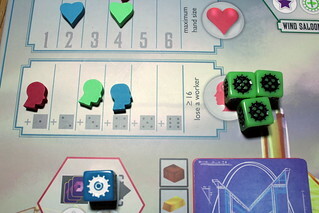 Instead of placing a worker, you can also use your turn to retrieve any number of workers from the board and roll them to make them available again. The decision how many and which workers to retrieve is crucial, this is the point where you are most likely to lose workers, either because you retrieve too many at once or because some friendly individual bumps one more that you then have to roll. Losing workers because they got too smart is painful, activating another worker takes a turn and costs three water or three electricity. In a darkly fun bit of flavour, activating a new worker with water increases your morale because it’s so refreshing, using electricity decreases your knowledge because of the electric shock straight to the brain. The third way to use your workers is to build markets. Euphoria, Subterra and the Wastelands each have two of them, randomly chosen at the start of the game and secret until they are actually build. To work on building a market, you place a worker and pay a resource. 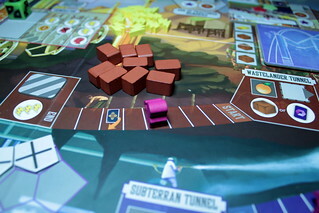 That worker stays until the market is built with two, three or four workers, depending on the number of players. You might not see that guy again for a while, because once work on a market is started, everyone tends to jump on it. There are two reasons for that. 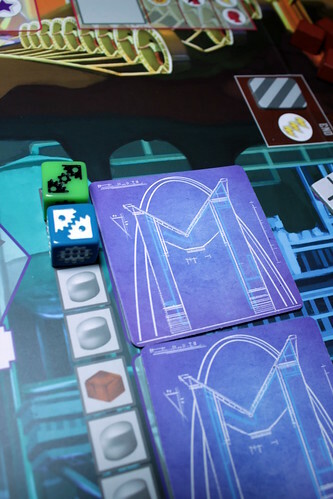 One: participating in the construction lets you place one of your star-shaped authority tokens on the market, and getting all ten of them on the board is how you win the game. And two: not having an authority token on a market incurs the markets penalty which, depending on the market, can be harsh: you may have to discard commodities every time you roll a five, or double all knowledge gains, or not benefit from certain bonuses until you place that star. The penalties are painful, and they add a devious element of interaction to Euphoria. By taking care when you start work on a market, you have some control over who will suffer the penalty. Or it could go the other way and everyone ignores you, binding one of your workers indefinitely. Oh, another cool thing about markets? They have names that would make Orwell proud. I especially like the Academy of Mandatory Equality. Once a market is build, you can use it to bring more of your authority to the board. For a usually pretty steep price, you can place a star in the Territory it belongs to. The Icarites, traders to the bone, don’t waste time constructing markets, they start the game with three fixed markets where you can pay to place your authority tokens, buy artifact cards or buy resources. All markets also have the side effect of strengthening their owner faction when used. The factions strength is tracked on the Allegiance Track, and the more it advances there the more bonuses you get on their actions. First you harvest extra commodities. Then you take both resource and artifact from the tunnel. On Allegiance Tier 3 all players must activate their inactive Recruits from that faction – more on them in a second – and finally, at the end of the Track, you may place an Authority Token on each Recruit of that faction. The first two bonuses, by the way, are only available to players with a Recruit of that faction, a little rule we overlooked at first. But who are these Recruits now? Well, as you yourself are proof of, not everyone in Euphoria is a dumb worker. There are exceptional individuals in all four factions that have a shot at greatness, or at least a shot at being your assistant. At the start of the game, you have two of those exceptional individuals, one of which is active. An active Recruit allows you to use the Allegiance bonuses from his faction, but he also has a special ability that you can use at will. These abilities vary widely, letting you take extra commodities under some circumstances, or allowing you to shed knowledge, or to gain knowledge in return for Artifact Cards, or… or …. or … . There are many Recruits with many abilities, and not all go well together and not all are equally powerful. The basic game mitigates that by giving you four Recruit Cards, two of which you choose to play with. It’s not too bad, but once you grasped how the game works – pretty much after finishing the first game – I strongly recommend that you play with the advanced rules and draft your Recruits: of your four cards, you keep one, pass the rest to the next player, pick one from the cards you received and so on. You’ll end up with four cards again and use two of those, but chances are much better for you to end up with Recruits that synergise. Unfortunately, Recruits that go well together are often from the same faction, meaning that picking those will only give you one faction’s Allegiance bonuses. Hey, I never said it was easy, getting to the top. One final piece of Euphoria is your Ethical Dilemma Card. An ethical dilemma is at the heart of all dystopian stories: do you support the system for your own safety and personal gain, or do you fight the system, hoping to free mankind from its clutches? It’s not as strong a theme in Euphoria as it is in dystopian novels and movies, but once in a game you make exactly that decision by revealing your dilemma card: support the system and immediately place another Authority Token, or fight the system and gain the support of another Recruit? Okay, this is a boardgame, so you won’t worry much about the ethics of your choice, but the impact on the game is not an easier decision, either. Getting rid of an Authority Token is good, but a third Recruit gives you additional bonuses and special abilities. It’s a tough decision. It’s not the only tough decision, though, you will be making many of those in Euphoria. With resources and commodities being in short supply and no way to get them except work for them, you really don’t want to waste them. There is, of course, some luck involved, first with getting useful recruits and then with rolling your workers knowledge. But the first is mitigated by playing draft as described above, and managing the second is part of the appeal of the game. You don’t have to retrieve all your workers at once, only picking up one or two dice makes it hard to impossible to exceed the 15 points of knowledge. On the other hand, playing that careful means you take more actions to get things done. Managing that risk well is essential and fun. Almost as much fun as bumping a worker back to the player who just rolled two sixes, forcing him too add another die. That’s one level of interaction in Euphoria, but not the only one. You also interact with the other players when constructing markets and in advancing Allegiances, where others may or may not profit from your actions. That’s much more interaction in a worker placement game than the usual “my meeple was here first”, and I enjoyed it a lot. Last, but certainly not least, Euphoria is a good looking game with custom dice, shaped wood tokens for the commodities and wood markers for your Knowledge and Moral Tracks, affectionately called the mindple and the heartple, based on their shape. And there I placed my two mandatory meeple words – I hope the editor is still reading and agrees that I have earned my bonus.